Nice morning, here, in the suburbs of Atlanta. The sky is clear, leaves are green, birds are chirping.. but, most importantly, the air is cool & crisp. That won’t be the case, in a couple months, as summer moves in with 90+ temps and 80% humidity. Folks will run their air conditioning units non-stop trying to escape from the hotlanta summer. I used to be one of those people. But, I won’t be paying an outrageous power bill anymore. Last year, despite my being an air conditioning addict, we didn’t use the A/C once and were able to save a good chunk of cash by leaving it off all summer long. If you’re looking to conserve energy or save on your power bill, here are some tips on forgoing the air conditioner. Acclimate. That’s right. You need to acclimate to the summer environment. Throughout the spring, as temps begin to rise, spend much of your time outdoors. Those mid-day temps will soon be your early morning temps. Invest in fans. This New York Times article may help you calculate the benefit of using fans vs. air conditioners. While our massive attic fan probably draws more power than the typical ceiling fan, I can guarantee you it’s not costing as much as an air conditioner. – A window a/c unit may use 1.2 kilowatts (that is, 1,200 watts) of power, costing approximately 14 cents an hour to run, at average utility rates. – A central air unit might draw 3 kilowatts of power, and would cost 36 cents per hour of operation. – The typical ceiling fan? Well, it pulls just 30 watts. And it can spin for three hours before the utility bill adds up to a penny. Use Water. Stay cool by hydrating properly. You should be drinking plenty of water. But, there are other ways to combat the heat using water. Setup your backyard pool in a shady area, take a dunk in a cool bath or shower during the hottest part of the day, and grab some Polar Breeze Bandanas. Edited: You can also visit, “spraygrounds,” which are gaining in popularity and popping up all over the south. See this post, by Atlanta’s Frugal Mom, for a list of some around Atlanta. Lightweight Clothing. Yes, this should go without saying. But, lightweight clothing will help your body stay cooler in warm temps. Libraries & Shopping, and other outings. Guess what? When it’s just too hot to bear being at home or in the yard, hit the library or make your grocery shopping runs. Chances are your local libraries & grocery stores have air conditioning. If you have museum memberships, 3PM in the middle of July is a great time to make the best use of them. Get a small convection oven, grill outdoors or fix more “cold” meals. Anybody in the south should know better than to use the oven in July. I found an excellent substitute for the summer months in a small, counter-top convection oven. It works great and doesn’t heat up my home the way the traditional oven does. You can also do more of your cooking, in a shady spot, on the grill or opt for no-bake meal fixins like sandwiches and wraps. Save even more money by line-drying clothes. 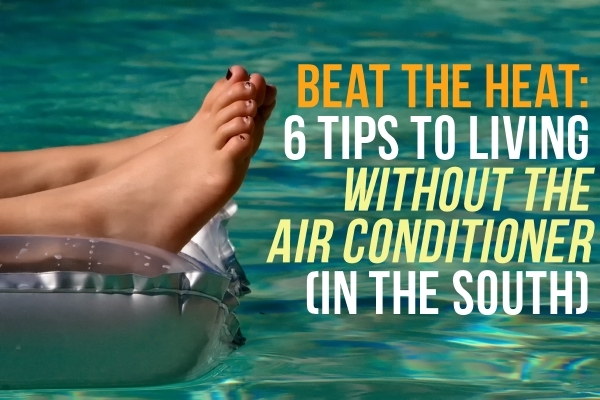 This is not related to the A/C, but it’s another great money-saving tip. Let me tell you about line-drying your clothes, in the south. It’s less expensive, environmentally friendly and faster than your dryer. In fact, if I hang the clothes during summer’s hottest part of the day, the first item will often be dry before I pin up the last one. What’s that, like 15 minutes?